Easily and quickly determine whether or not an After Effects file is the most up-to-date compared to its auto-saved versions. If you've used After Effects for a while, you'll know how frustrating it can be to have After Effects crash on you. Sure, After Effects has an "Auto-Save" feature where files can be automatically saved at specified intervals but, even so, you still have to figure out which version of your After Effects file is the most up-to-date: your original AE file or an auto-saved version. This can be frustrating in that you have to manually compare modiciation times of your AE file and its most recent auto-saved version. Why add frustration to an already frustrating situation? Introducing Latest Version, a script that takes an AE file and compares its modified time to that of those in its auto-save directory and presents an easy to understand prompt for you to select what action you would like to take (open main file, open latest auto-saved file or overwrite the main file with the auto-saved file). **Note:** This script is useless if you do not use After Effect's auto-save feature. While not everyone enjoys using After Effect's "auto-save" feature, the author of this script has been saved (no pun intended) multiple times from losing precious minutes of work by having After Effects save every 5 minutes. It makes him happy knowing that he will only lose 5 minutes of work if After Effects decides to crash while he is working on a time-sensitive project. However, the inefficiency of having to browse for his AE project file to figure out if it is more up-to-date than an auto-saved version frustrates him and makes him want to cry. If you too wish there was an easier way to determine if your After Effects file is more up-to-date than its latest auto-saved file, then this script is for you. 1. Click on 'Get Latest Version'. This will bring up a dialog window allowing you to select the After Effects project to use as the file to search for newer versions of. 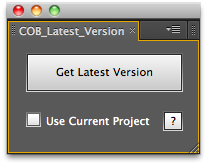 If you would like to use the current project as the main file, select 'Use Current Project' and then click on 'Get Latest Version'. Option 1: Open the main file. Option 2: Open the auto-saved file. Option 3: Overwrite the main file with the auto-saved file and open the main file. **NOTE:** Overwriting the main file with the auto-saved file cannot be undone so you will be asked to confirm this option. Once you have confirmed, the main file will be overwritten with the auto-saved file (and consequently renamed to the main file's name). 4. Click on one of the three options presented to execute the option.